Little Gates is a beautifully decorated One Bedroom Apartment suitable for two (2) persons and furnished with your comfort and enjoyment in mind. The Living / Dining room has a sofa bed, cable TV, ceiling fans as well as a breakfast bar with stools. The kitchen is fully equipped with cutlery, crockery, stove with oven, microwave fridge/freezer, toaster, coffee perk & electric kettle. There is a bedroom area with a Queen bed, this space is air conditioned as well as fan cooled. The Bathroom has a spacious shower. The apartment has WiFi and cable TV. The garden is private and comes furnished with an umbrella, sun loungers, table and chairs for al fresco dining. There is a banana grove, lots of bougainvillea flowers and of course the little birds and if you are lucky a Barbados Green Monkey or two!! Little Gates is suitable for 2 persons and is located next door to a larger detached house, Green Gates Holiday Rental which is suitable for a family or group of up to six ( 6 ) persons. We live in Barbados year round and love island living! You will love our comfortable three bedroom cottage and the one bedroom apartment as well. We have furnished the house and apartment to make it cheerful, comfortable and to have everything you would need to make your stay enjoyable and relaxing. We are there to offer advice on tours, restaurants, etc and to assist in any way we can. Barbados is our favorite island in the Caribbean, there is so much to do here or you can opt out and just hang loose. The social activities on the island are numerous, from horse racing and polo to fashion shows and great nightlife with lots of live music. Great golf courses as well. It is our promise to you that we will do all that we can to make your time at Green Gates & Little Gates a happy and memorable one! We fell in love at first sight with this place and we have carefully and personally restored the apartment using materials such as stone tiles for the floors and wooden ceilings. The Maxwell area is pleasantly breezy year round and boasts good weather which will allow you to enjoy the outdoor setting. Enjoy a beautiful, romantic sunset, sipping a good Chianti wine, before cooking fresh fish from the nearby Oistins Fish market. Deal Gardens is a residential area and is perfectly situated within 2 minutes walk to the nearest beach. Supermarket, doctor's office, pharmacy, and restaurants etc nearby. Bridgetown - the country's capital - is a car or bus ride away. Fifteen minutes drive from the airport. Airport pick ups and drop-offs can be easily arranged for all our (website hidden) Lawrence gap, a short 10 minute drive away, is teaming with bars, restaurants, nightclubs, street markets and boutique shops. If you are looking for peace & tranquillity then this is the neighbourhood for you, however all the fun and excitement of the vibrant south coast is within easy reach. The apartment is:- • In a safe, quiet neighbourhood • Moments from the Maxwell Beach • Handy for the restaurants, clubs and bars of St. Lawrence Gap • Easy access to all the tourist attractions the island has to offer. • You can walk to Oistins Being so close to all bars, restaurants and clubs is one of the many reasons our guests love staying in the Maxwell area. Very clean, well decorated. Staff was helpful, friendly and professional. Couldn't have been more satisfied, thank you. A great little place with all the home comforts you need for an enjoyable stay. The bedroom has a cool breeze blowing through at night so you don’t even need the air-con on. It is well placed for the beach, just a 5 minute stroll away and buses pass the end of the road all the time to take you down to The Gap in one direction or Oistins in the other. The supermarket is in Oistins, a 20 minute walk away along a busy road but with some lovely beach views, and a 2 minute bus ride back with your shopping. Sharon is great, always on hand to make sure everything goes smoothly. We had a lovely, lazy stay. My friend and I arrived at Little Gates on 3rd Aug for the closing of Crop Over. Before we arrived, Sharon arranged airport transfers for us at a cost of $25. Once we arrived at the property we were over the moon as not only was the accommodation eexactoy how it looked in the pictures but, it was clean and equipped with all the necessary amenities. They also provide a great wifi connection and a safe for your own safe keeping. We were giving a run down by Mike, our driver, who gave us a few tips that really helped with our getting around the island. Little Gates is conveniently placed in the middle of Bridgetown, St. Lawrence Gap and Oistins so, you’re never short of places to eat, food to buy for the house. All in all, we had a lovely stay here and if we were to ever come back again, we’d definitely stay at Little Gates. Thank you for having us. Thank you Felecia & Winston, you were the perfect guests. We appreciate that you took the best care of Little Gates and look forward to welcoming you back. From booking Little Gates 9 months before arrival to our departure. Sharon and Peter were perfect hosts. They kept in touch by Email/Whatsapp and offered a taxi service and were very open to any questions we had. The accommodation is ideal for a couple or a single traveller. The quality of the furnishing particularly the bed were exceptional for this type of rental. The location is very quiet and benefits from a small garden with table and chairs for outside dining. There are also 2 sun loungers and 2 very comfortable chairs. You do get the occasional Monkey visiting the garden I would imagine more when there are figs on the trees. It's very simple to get buses and ZR mini buses, both within 2 minutes walk. Very good value, the fixed price is 1 Usd for anywhere on the island. The local beach is only a few minutes walk away although better beaches are easily reached by the ZR's. There are a hotels within a few minutes walk with restaurants. Our favourite was the Borgainvillea which has 2 good restaurants. Also close by is a Bar 1 a small bar that had really good live music and very friendly owners. Oistons is definitely worth visiting we walked, which took around 20 minutes each way, the bus would be 5 to 10 minutes. Fridays and Saturdays are the main nights although restaurants are open every night. My advice would be to go there hungry as the portions are huge. St Lawrence gap is around 10 minutes on a bus or 30 minutes walk away. Here there are a wide choice of restaurants and bars for the evenings. Finally a big thank you to Vanessa who cleans the accommodation. She keeps the apartment spotlessly clean and is a huge asset to Sharon and Peter. 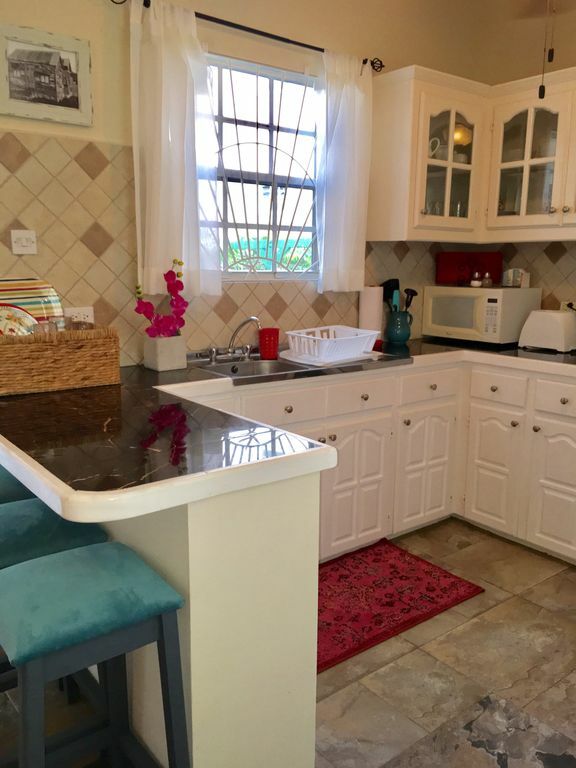 If you are visiting Barbados contact Sharon about Little gates or if you are a bigger family next door is Green Gates which is immaculate and furnished to a very high standard.